How do you write a history of a group that has been written out of history? 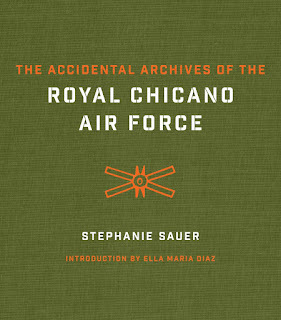 Employing a creative mix of real and fictive events, objects, and people that subverts assumptions about the archiving and display of historical artifacts, Stephanie Sauer's innovative new book The Accidental Archives of the Royal Chicano Air Force both documents and evokes an arts collective that played a significant role in the Chicano movement. The RCAF started as the elusive Rebel Chicano Art Front that, through an understandable mix-up with the Royal Canadian Air Force, became the Royal Chicano Air Force, a group renowned for its fleet of adobe airplanes, its ongoing subversive performance stance, and its key role as poster makers for the United Farm Workers Union during the height of the Chicano civil rights movement. Reimagining herself as a fictional archaeologist named 'La Stef', Stephanie Sauer documents the plight of the RCAF, suspending historical realities and leaping through epochs and between conversations with various historical figures, both dead and alive, to offer readers an intimate experience of RCAF history. 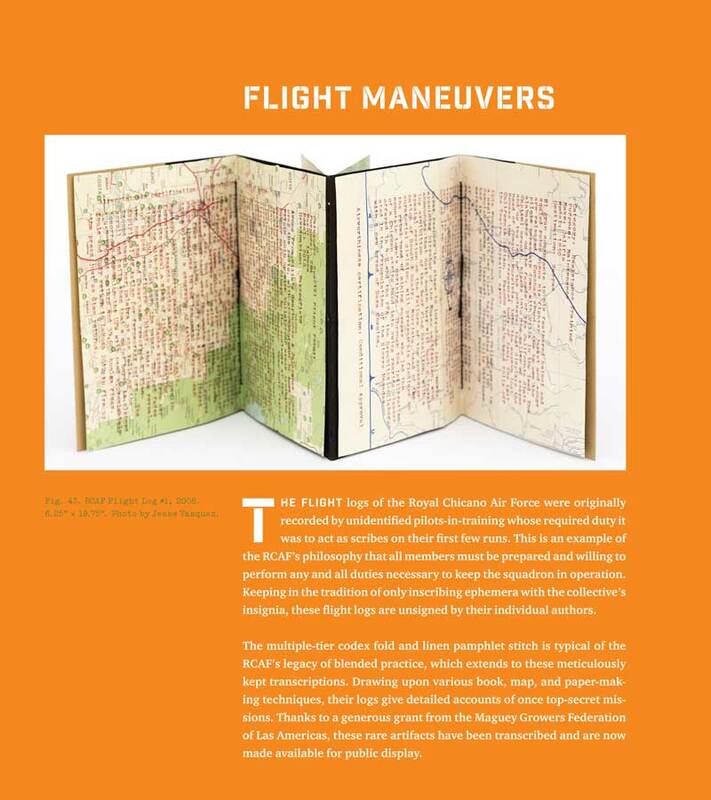 A cofounding editor of A Bolha Editora, a bookshop and publisher in Rio de Janeiro, and executive editor of Copilot Press, Stephanie Sauer is an interdisciplinary text-based artist and visiting lecturer at the San Francisco Art Institute. We talked to her about her approach to this project and how institutions should embed experiential learning, i.e. : "embodied knowledge," into pedagogical approaches. What informed your approach to how you presented this archive, which is described in the introduction as your “deeply personal, biased, and shared witnessing”? Before I conceived of what is now The Accidental Archives, I spent a year writing what I had been expected to write. 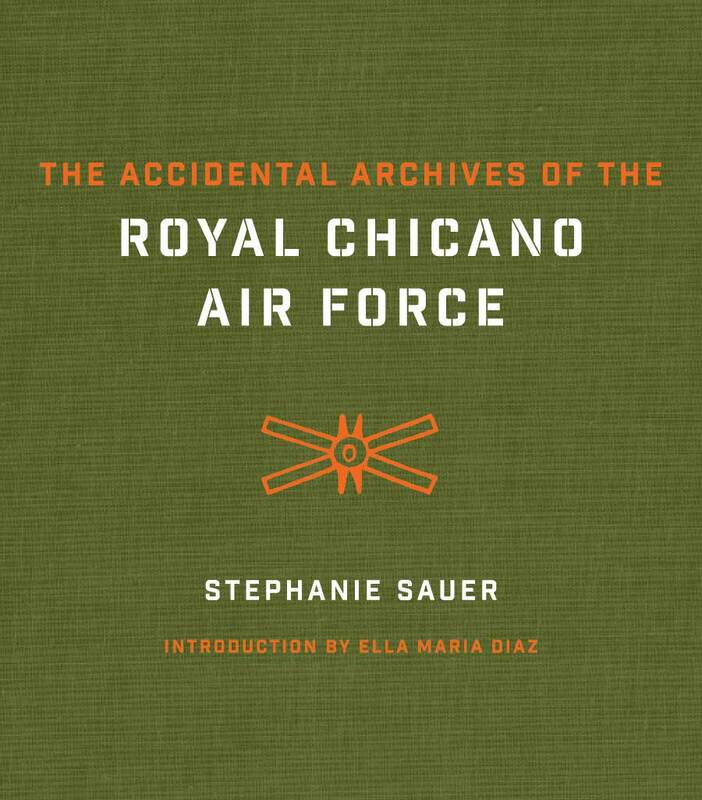 That is, I wrote a history of the Royal Chicano Air Force as I encountered it in the 21st Century. It was a story one would expect to read. It was a story I had read many times before. I was in Chicago then, a microcosm of a United States obsessed with its divisions, and found myself answering to the expectations of readers who wanted me to translate Chicanismo for them, to act as a type of mediator whose task it was to create a didactic, easily digestible history. This way of writing bored me, and I found it deeply problematic. I saw myself as facilitator to a kind of colonial fantasy that pitted me as an objective, rational (read: white, anthropological) narrator of an RCAF documentary. I didn’t want to perpetuate such ideas of otherness, so I threw out that entire manuscript and started fresh from three scraps, the very first notes I’d written. Inaugural Flight of LaRuca 2012. With permission of use of Los Files © Juanishi V. Orosco. Courtesy of Juanishi V. Orosco. What Dr. Diaz noted in her introduction as “deeply personal, biased, and shared witnessing” is, for me, the richest way to present any history. Rooted in feminist practices of testimonio, embodied knowledge, “disruptive excess,” and collective witnessing, I found it vital to foreground the multiplicity of voices and their contradictions, the tactile ephemera, and the biases. Otherwise, when one tries to smooth over these elements in favor of a clean, linear narrative, the tremendous violence of silencing distorts the humanity of those making history. It is this type of silencing that alienates us from our own power to impart change. I wanted to offer an alternative. I wanted to upend the so-called logic of traditional, Western, male-centered historiography and imagine what a new kind of archive might include. Talk about the “suspicion” that you infuse into your archival evidence of RCAF history. Do you consider it a politically subversive strategy? Any hint of “suspicion” is simply a result of critical reading, of paying attention to the way our world is constructed and to the ways in which our histories are rendered. Any deep study of history teaches us to read critically, and to notice our lives as part of a historical continuum. By reading the archive as a politically charged suppository of our collective pasts, its malleability became clear. As a maker, I am constantly questioning. I encourage my students to question everything, especially themselves. The moment we become too rigid in our thinking is the moment we stop seeing. And that simple act of questioning is one of the most subversive strategies I know. Explain the process of writing through your unique archivist identity as ‘La Stef’. How did that approach help you develop your ideas? The La Stef character came about after I scrapped that first year of writing and began to see the RCAF locura that I had been writing about as a powerful way to enter the text. I had also been in conversation with mask maker and performer Zarco Guerrero and playwright Ruth Margraff at that time, and I started actively playing with the idea that the white anthropologist “mask” that had been cast upon me could be put to better use. “La Stef (my favorite hillbilly of all time)” was the nickname José Montoya had given me years prior, and I wanted to pay homage to the playfulness and cariño with which it was given, as those qualities are also at the heart of this work. In practice (because there are some things you can only understand by doing), I found that the La Stef character was incredibly powerful for me. 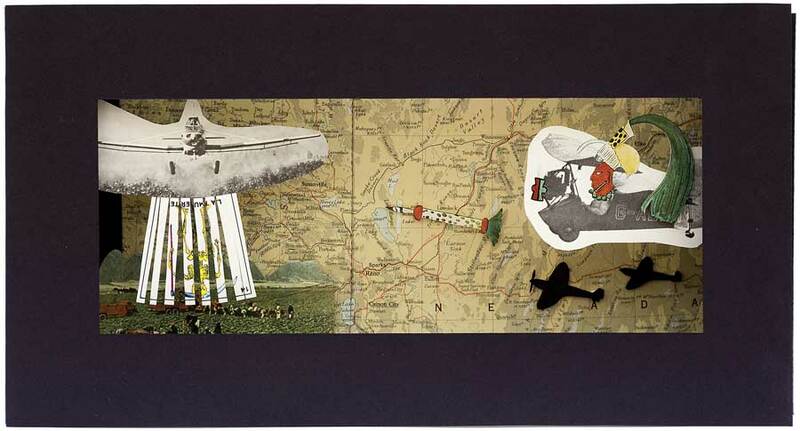 She allowed me distance and yet a strange new intimacy with the text and with archive making. She is also the perfect vehicle through which to critique the colonial expectations some readers hold. 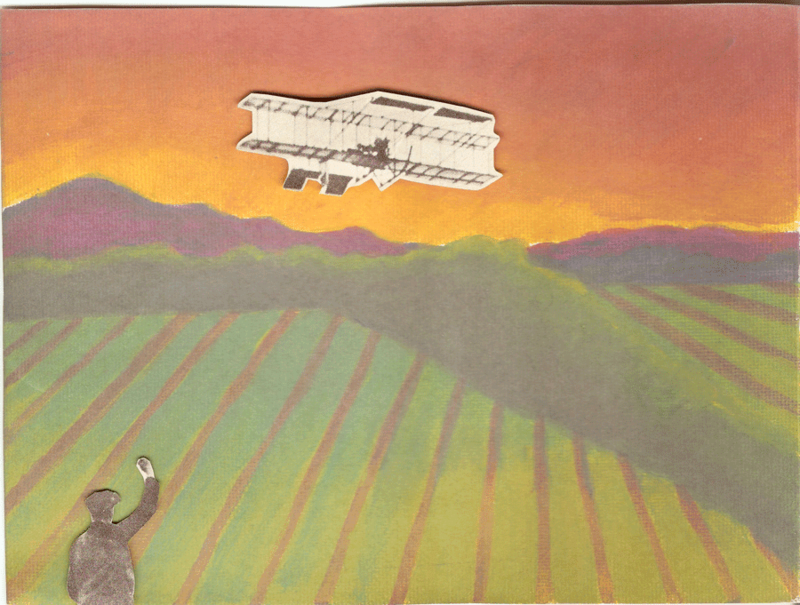 The Yolo County Crop Duster, Incident (hieroglyph), 2014. 7.5" × 14". Photo by Jesse Vasquez. How would you characterize the role of educational institutions in preserving and teaching the legacy of the RCAF and its work? Educational institutions are incredibly vital to both preserving and teaching the impact of the RCAF. As many of us know, these institutional spaces—not only ethnic studies programs, but higher education as a whole—are currently under threat as for-profit business models erode the university as a site of deep inquiry, investigation, and becoming. (I am writing this as a member of the contingent labor force known as adjunct faculty. By now, we all know this story.) But studying the work of this group and how their legacy has been remembered and forgotten can teach us so much about the history of these borders we keep inventing, of the Americas, about art, media, politics, economics, labor history, urban development, archiving, and performance. Their legacy is a kind of prism through which so much of our current lived experience can be illuminated. The RCAF cannot only be taught by showing slides of poster art or airing a documentary, but must also be integrated into our pedagogy. There is something vital in learning through direct contact, in sitting at the feet of our elders—all of our elders—and hearing the stories directly from them. The lapses in memory, the hard earned reflections, the frustrations and pride and bitterness and love, the very tenor of their voices all convey something that we can never find in textbooks or absorb through third party narrations. There is also something vital in discovering our own stories as powerful sites of embodied knowledge, as connected. I would love to see more direct participation become part of institutional learning, even at the undergraduate level. 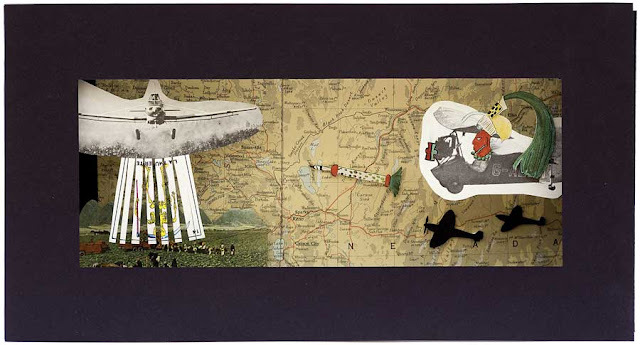 The Barrio Art Program at Sacramento State University, founded by RCAF members as a way to link university students with the downtown Chicano community, is just one example of the myriad ways embodied knowledge can transform formalized learning. I am a product of the Barrio Art Program. I am a product of so many brilliant thinkers and practitioners who transformed higher education into a revolutionary space for working class students like me. This book is, in part, a nod to that legacy. RCAF Flight Log #1, 2008. 6.25" × 19.75". Photo by Jesse Vasquez. What ‘characters’ do you credit as key to your engagement with the Chicano/a artistic and intellectual activist movement? I like how you phrased this question. At one level, history reads like fiction and the personalities we meet indeed become characters we craft into being by a mix of imagination and fact. We do this as individuals and also as nations. 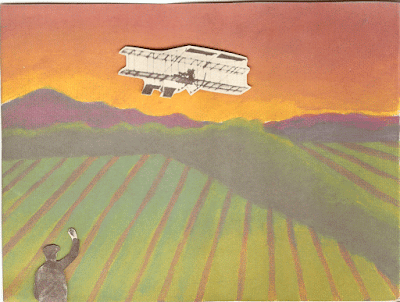 The first ‘characters’ to formally bring El Movimiento to life for me were Cherríe Moraga, Gloria Anzaldúa, and Ana Castillo. I came in through a queer side door, I guess. The other was Reies López Tijerina. In his radical call for land rights and accompanying interventions I found something I called Truth. Yet my real engagement came when I met Professor Ricardo Favela at California State University, Sacramento, who led me to a 91-year-old Salvadoran refugee at the Washington Neighborhood Center who shared with me her stories. Professor Favela also led me to Marisa Gutiérrez, director of La Raza Bookstore & Galeria Posada. Marisa then introduced me to RCAF co-founders José Montoya and Esteban Villa, and ushered me in through the back doors of La Bookstore at O Street so I could conduct an interview for their brochure. While we talked, Villa sketched my likeness in a Prismacolor felt tip marker on a 4”x6” drawing pad. That was the first time I met La Stef. But the character who first sparked me to engage with these artistic and intellectual traditions was my aunt, a woman of mixed Japanese and English-American heritage who helped raise me. She was the only person in my family who had attended college and we spent many, many, many hours in her kitchen talking fight and freedom and her own brand of mestizaje that crept beyond Vasconcelos’ borders and into a tiny mining town in the foothills of the Sierra Nevadas. What I later found in Chicanismo was a way to understand being of my family, of this country, of this continent, and a way to continue creating them.